Due to the hype surrounding the release of the summer blockbuster re-make, the gilded age will be all the rage from now until next February when we’ll learn if the effort proved Oscar worthy. 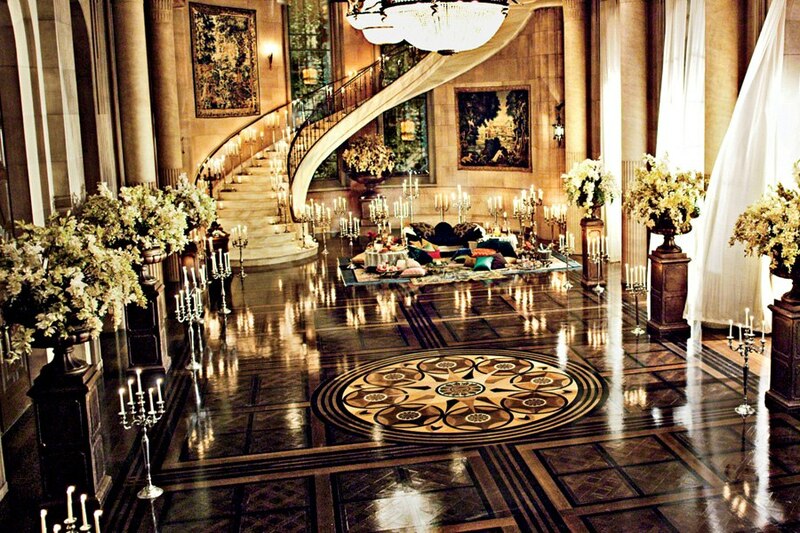 Large ornate parquet wood floor patterns adorn the hall in the set from the recently released film adaption of the great American novel. According to the fantastic book The Elements of Style, the setting would have fallen into the American Beaux Arts period. A time when “private fortunes were being made, and hundreds of wealthy citizens were building lavish town houses and country estates in which specific motifs were borrowed from historic European styles. The splendid new mansions were reminiscent of French chateaux, Italian palazzi and Elizabethan manor houses, and their owners may have perceived themselves as modern equivalents of Renaissance princes”. Wood flooring in this era was defined by large parquet patterns built with intricate designs and the use of multiple species as correctly portrayed in the film set above. For a gallery of other parquet wood floors visit our Parquet Wood Flooring Gallery on Pinterest.